Recently hosted the first test run of our tuk-Tuk! We had a little cold and decided that we needed tuning, which we would not be afraid neither a rain, nor snow, nor wind! The fruits of our labors can be assessed on the upcoming weekend. 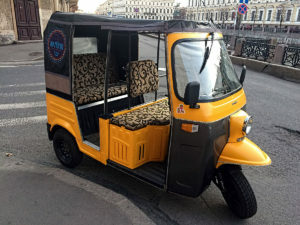 Remember that throughout the season each weekend we drive everyone to the tuk Tuk absolutely for free! This year we also provide tuk Tuk hire — to rent a tuk-Tuk call: +7 (921)743-77-10.